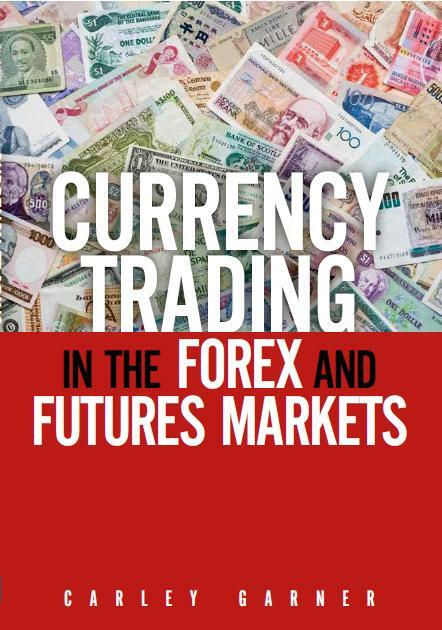 Carley Garners third trading book is "Currency Trading in the FOREX and Futures Markets". The book highlights the primary differences between speculating in the various currency trading arenas; FOREX, currency futures, and currency ETFs. Carley Garner's futures, options, and FOREX trading books have been reviewed by several national publications. Here is a sample of some of the trading community book reviews. 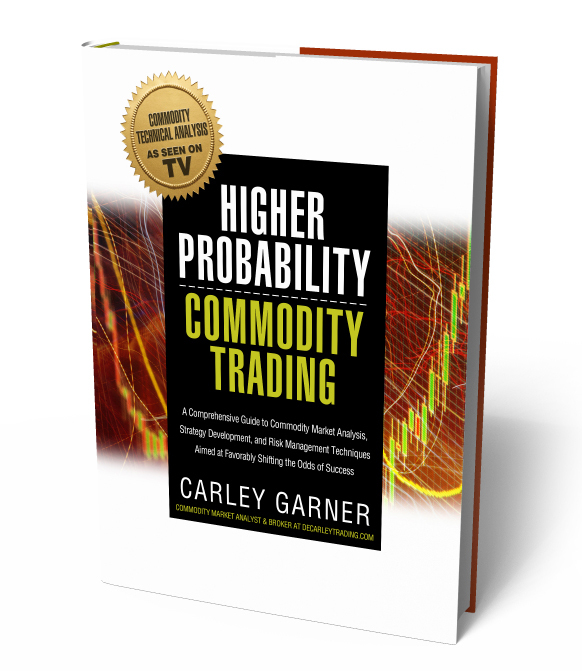 Learn to trade futures, options, and FX with Carley Garner books! Carley Garner, a futures broker at DeCarley Trading, is the author of multiple trading books. The intention of the publications is to compile lessons learned as a long-time commodity broker, and deliver them to readers in simplified and efficient educational material for futures, options, and FOREX traders. Click here to see the latest press coverage, commodity educational articles, and trading videos by Carley Garner. If you are going to trade currencies in the futures or FOREX market...You had better shorten the learning curve! Currency Trading offers immense potential to stock and futures investors seeking new speculative opportunities. However, there are several ways to trade in currencies, and many unsuspecting traders have been burned by aggressive marketing campaigns and gimmicks luring them into unfavorable trading environments. In this currency trading book, best-selling trading author Carley Garner covers everything new FX and futures traders need to know to avoid those pitfalls in hopes of earning substantial profits. "Currency Trading in the FOREX and Futures Markets" begins by demystifying all the essentials, from quotes and calculations to the unique language of FX trading. Readers learn all they need to know about choosing currency trading platforms and brokerage firms; working with leverage; controlling transaction costs; managing liquidity, margins, and risks; and much more. Carley Garner thoroughly explains the currency spot market (Forex, a.k.a. FX); currency futures traded on the Chicago Mercantile Exchange (CME Group) and elsewhere; and currency ETFs. She candidly discusses the advantages and disadvantages of each, cutting through the "smoke and mirrors" often associated with currency trading. Readers will also find a full section on currency market speculation, including a clear introduction to fundamental and seasonal analysis in the futures and FOREX markets. With her guidance, new currency traders can identify the trading venues and approaches that best fit their objectives, and avoid the traps that have often victimized their predecessors. Thanks to the CME Group (Chicago Mercantile Exchange); financial institutions along with investment managers, corporations, futures brokers, and private entrepreneurs have a regulated and centralized forum in which they can manage their risk exposure to changes in currency valuations. Naturally, where there are hedging opportunities there is also room for mass speculation and that is exactly what occurs every Sunday afternoon through Friday at the CME. While many argue that the cash currency market, often referred to as Forex, is a much larger arena, I believe that the CME offers a very competitive trading environment in terms of execution. I also believe that the CME currency futures are superior in terms of transparency and credibility. This particular article isn’t intended to clarify the differences between Forex and currency futures, however, if you are interested in illumination of the arguments for and against each trading forum, be sure to read my book “Currency Trading in the FOREX and Futures Markets” published by FT Press (www.CurrencyTradingtheBook.com). Currency futures are traded electronically on the CME's Globex platform and are, for the most part, traded in "American terms". This simply means that the prices listed in the futures market represent the dollar price of each foreign currency or how much in U.S. dollars it would cost to purchase one unit of the foreign currency. In order to understand the point of view of the futures price ask yourself; "How much of our currency does it take to buy one theirs?" To illustrate, if the Euro is trading at 1.1639, it takes $1.16 39/100 U.S. greenbacks to purchase one Euro. All currency futures contracts are categorized as financials, and therefore have a quarterly expiration cycle. Similar to Treasury bonds and stock indices, currency futures contracts expire in the months of March, June, September and December. Additionally, like the other financials, currency futures are traded nearly 24 hours per day. The CME halts trading for 45 minutes Monday through Thursday day between 4:15 and 5 PM Central time in order to maintain the electronic trading platform, and of course trade is halted on Friday afternoon in observance of the weekend. Please note that the CME lists several currencies and even currency pairs (cross currency pairs that involve two currencies other than the US Dollar), that are not discussed within this article. The omission of such contracts was intentional. Many currency futures and pairs contracts are listed but do not have the ample liquidity necessary to make them a viable choice for speculators. It is also important to realize that currency futures have no daily trading limits. Unlike raw or agricultural commodities, there is no limit to the amount in which currencies can appreciate or depreciate in a single trading day. There are arguments for and against price limits but in my opinion this is a positive characteristic because it prevents unnatural price floors and ceilings and avoids locked limit trade in which speculators are unable to exit a market. Of course there is a flip side, without price limits the currency markets can make very substantial moves on a daily basis. However, I will argue that in the long run a lack of price limits actually works to reduce market volatility. This is because a futures market that has gone “locked limit”, often accelerates panic felt by traders caught on the wrong side of the market and unable to exit their position. The value of one futures contract is 125,000 Euro so each tick higher or lower changes the price of the contract by $12.50 and translates into a profit or loss to the trader in that amount. This is true of a majority of the currency futures. The Swiss Franc and the Japanese Yen share the characteristic of a $12.50 tick value. Once you know the tick value of any particular currency futures contract, it is easy to compute the dollar amount of risk, profit and loss. For example, a trader that is long the Euro from 1.1239 and liquidates the position at 1.1432 would be profitable by 193 ticks or $2,412.50 (193 x $12.50). This is calculated by subtracting the purchase price from the sale price (exit) and multiplying that figure by $12.50. The contract specifications of the Swiss Franc futures are identical to that of the Euro. Accordingly, the contract size is 125,000 Swiss Franc and the tick value is $12.50. With that said, calculating risk and reward is also the same. The only significant difference between the Euro and the Franc futures contracts are the price at which they trade. Therefore, a trader that is short the “Swissy” from 1.0375 (nearly at par with the U.S. Dollar) likely believes that the value of the Franc will diminish relative to the greenback. However, the trader may also want to place a stop loss order to mitigate the risk of being wrong. If the stop order is placed at 1.0440 the funds at risk would be $812.50 ignoring commissions and potential slippage in the stop fill. This is figured by subtracting the entry price from the stop price and multiplying by $12.50. 65 x $12.50 = $812.50 commissions and fees and ignoring potential slippage are not included in this assumption of risk. At this price, it takes about a little over $1.00 to purchase one Swiss Franc. If the Franc were trading at $1 it would be described as being in parity with the Dollar or simply “at par”. The Japanese Yen is the most unique of the major currency futures contracts traded on the CME. The contract size is 12,500,000 Yen, yes that is right; twelve and a half million Yen. Despite the incredible contract size, the Yen has a tick value of $12.50 along with the Euro and the Swiss Franc. Thus, all calculations are treated in an identical manner. On a side note, the massive contract size is necessary because the Yen is closer to being an equivalent to the penny than it is the dollar in U.S. currency. The British Pound futures contract differs from the Euro in terms of contract specifications. A British Pound futures contract represents 62,500 Pounds Sterling (British Pounds). Just as the contract size is half that of the typical currency, so is the point value. Each point Pound of fluctuation represents a profit or loss of $6.25 to the futures trader. The numbers are different, but the process is the same. A trader long the British Pound from 1.5732 but wanting to limit her risk to $1,000 would place a sell stop 160 points beneath the entry point at 1.5572. The number of points at risk can be determined by dividing the desired risk of $1,000 by the tick value, $6.25. Likewise, if the same trader later chooses to offset her long futures contract at 1.5643 (hopefully she remembered to cancel her stop), the realized profit would have been 71 points or $443.75. This is figured by subtracting the sale price from the purchase price and multiplying by $6.25. Currencies in which their valuations are highly dependent on the exports of commodities are often dubbed as “commodity currencies”. The Australian Dollar and the Canadian Dollar are perhaps the most commonly traded commodity currencies. For instance, a relentless rally in crude oil and other commodities are generally supportive of the value of the Canadian Dollar, but sharp commodity declines will drag these two currency futures contracts lower. This is because Canadian and Australian exporters will likely sell products in terms of their domestic currency. The increased demand for their commodity products will have a direct impact on the demand for the Canadian currency and thus favor higher valuations of the “looney”. In fact, for the first time in decades, the Canadian Dollar traded at par with the U.S. Dollar in 2007 at the height of the commodity craze, and again in 2011 on a similar run in the commodity asset class. The Australian Dollar futures contract, often referred to as the Aussie, has a contract size of 100,000 Aussie Dollars. Consequently, the tick value of the contract is $10. Like the others, The Aussie futures expiration months are quarterly and there are no set price limits on daily trading. Due to its convenient point value, risk and reward calculations can be figured by simply adding a zero or moving the decimal point one place to the right. To illustrate, a profit of 1 tick is equivalent to a profit of $10; likewise, if the market rallies 200 points a futures trader would be making or losing $2,000. For instance a move from .7298 to .7398 equates to 100 points, or $1,000 in profit and loss to a commodity trader. The contract specifications for the Canadian Dollar are nearly identical to those of the Aussie Dollar futures. The contract size is 100,000 Canadian Dollars and the tick value is $10. Once again, working the math in this contract is as simple as adding a zero. A trader that is short a Canadian Dollar futures contract from .7940 and subsequently gets stopped out of the position at .8400, the realized loss would have been 460 points or $4,600. Hopefully, you wouldn’t let your losses run to this extent but anything is possible. In the past the Mexican Peso futures contract offered questionable liquidity and few opportunities for speculators. However, the Peso has become much more popular among speculators and is worth taking a look at. Like the British Pound futures and the “commodity currencies”, the contract specifications for the Peso differ greatly from the norm. 500,000 which is a great deal bigger than those assigned to the Euro or the Swiss Franc futures. Each point in the Peso is equivalent to a $5 gain or loss for any trader with an open futures position. Also unique to the Peso is the expiration months. The Peso has a contract listed (that expires in) each month as far as 13 months in advance. This is the only currency that allows traders to trade contracts expiring in each and every month of the year, they typically have quarterly expiration months. However, it takes more than an exchange simply listing a contract for speculators and hedgers to get involved. In fact, there is often very little, if any, open interest in any of the non-quarterly contracts (January, February, April, etc.). In other words, you should only trade the March, June, September, and December Mexican Peso futures contracts! Despite all of the differences in the Peso relative to the other currencies, the calculations involved in trading it are very similar. Like the others you would simply take the difference between the purchase price and the sale price and multiply it by the tick value to reach the total profit or loss on a trade. A trader that sells the Mexican Peso at .076425 and is forced to buy it back at a loss at .077385 would have realized a loss of 96 points or $480.